Anne Marriott was born in Victoria, British Columbia. She began her writing career at an early age, and since the 1930s has produced several poems, short stories, and radio scripts. Her poetry, in particular, has been widely anthologised throughout Canada and the United States. 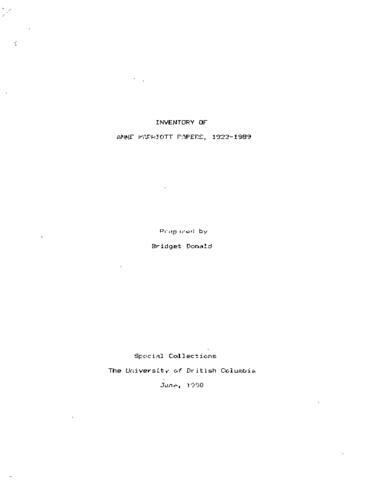 Marriott worked as a script writer for the National Film Board in Ottawa in the 1940s, and later, for the CBC in connection with the British Columbia Ministry of Education. Her poem "The Wind Our Enemy" (1939) was widely acclaimed. She won the Governor General's award for her chapbook, "Calling Adventures" (1941). Permission of Marriott to be obtained for access to one letter.